Over the last fifteen years, mobility solutions have evolved from cell phones and pagers to platforms for wireless email and mobilizing business applications. Today's road warriors depend on their mobile devices for fast, reliable, easy access to applications and corporate data. Mobile solution downtime can adversely affect customer service, productivity, sales, and revenues. 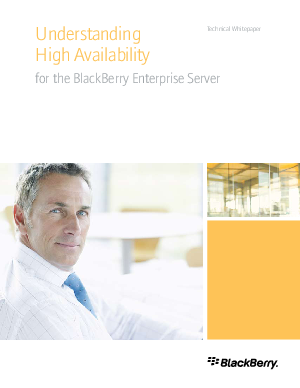 This white paper introduces high availability in a mobile context, describing user expectations and provides an overview of the BlackBerry Enterprise Server and a comprehensive explanation of the architecture. Topics such as load balancing, setting failover thresholds, monitoring high availability, maximizing configuration databases and limited down-time upgrades are discussed.